شناخت خود ازجمله مطالب و موضوعات مهم و مورد توجه در مکاتب مختلف الهی و غیرالهی است. 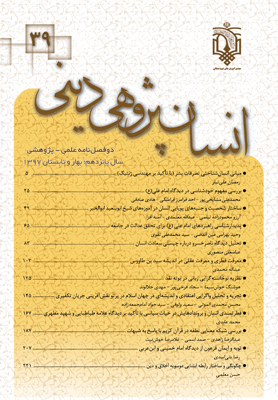 امام علی­(ع) برای اشاره به این موضوع از عبارت «معرفت نفس» استفاده کرده­اند که مقایسه و تطبیق با دیگر کلمات و عبارات متعدد مترادف در‌این‌باره، دقت و نکته­سنجی حضرت را به تصویر می­کشد. خودشناسی بر دیگر انواع متصور شناخت مقدم است؛ در اهمیت آن، همین بس که غایت علم و معرفت، برترین عقل و حکمت­ها، فوز اکبر و ... نام گرفته است. تأکیدات و توصیفات فراوان درباره خودشناسی، وقوع آن ممکن ساخته، لکن واقعیت جاری زندگی انسان، نمایان­گر چیز دیگری است. سهل­بینی، خودمحوری و خویشتن­پسندی، نیکوپنداری، تحویل و تحصیر، راحت­طلبی، خدافراموشی و جهل و نادانی، ازجمله موانع خودشناسی به‌شمار می‌رود که در کلام امام علی­(ع)به آنها اشاره شده است. Self-knowledge has been amongst important concepts and issues in divine and non-divine schools of thought. To underscore this concept, Imam Ali (a) has employed the word Ma’rifat- e Nafs (Knowledge of self) comparing which with other synonyms words and phrases uncovers the accuracy and perspicacity of choice. Self-Knowledge is prior to other kinds of knowledge in importance. For the same weight it is also called the utmost of science and understanding, the highest of wisdoms and reasons, greatest of deliverances and etc. Numerous stipulations and description of self-knowledge has made this concept realizable but the reality of current human life runs contrary to it. Nonchalance, self-centeredness, egotism, self-excellence, devolvement, complacency, God-forgetfulness, negligence and ignorance are amongst barriers in the way f self-knowledge which are pointed to by Imam Ali (a).